First, I have to apologize for this photo. I just could not get a good picture of this wall. No matter what time of day I try, there is always glare on one of these frames. That said, let's talk a little bit about compromising with the kiddos. Okay, I know, my oldest is 8, I have yet to see the real disagreements begin when it comes to decorating. But still, he has his own ideas of what he wants. Now, the trick is the fact that he shares a room with my two other boys. I didn't want it to be too specifically tailored to one boy over another. But Mr. One is a HUGE (and we're talking HUGE) Star Wars fan. He would have loved it if I'd used this bedding in his room, but I couldn't bring myself to do an entire room of Star Wars...even if it DID come from PB Kids. So we compromised. I took a couple of Star Wars movie poster from his old calendar and framed them up. Then I had these vinyl letters custom made. I figured that "May the Force be with You" was a somewhat inspiring phrase. At least the most inspiring I could think of...aside from "Size Matters Not" in the framed poster. Now on to some fun awards. My family. My children are a constant source of inspiration. And my talented photographer Hubby does his fair share of inspiring too! Design books. I can't get enough of them. I have a bookshelf full and my collection is still growing. Along those same lines...magazines, shelter mags, design mags, specialty mags like those from Stampington and Co. This beautiful earth...especially the mountains and the ocean. I grew up living at the base of the Wasatch mountains, and now I live only about an hour from the ocean. God's creations are amazing. How can anyone not be inspired when they see them? The Arts...but especially Dance. I danced for nearly 25 years, and then I worked in Marketing and PR for a professional ballet company until my oldest was born. There is something incredibly magical about Dance. Blogging. Since I started blogging, I have been thoroughly amazed at the amount of talent that people are so willing to share. I am constantly inspired by the blogging community that I am a part of, and my head spins with ideas from all the wonderful things you all share. Not only that, but this little corner of the blogosphere is so uplifting and supportive, it is lovely to read all of your INSPIRING comments on a daily basis. Please keep them coming! Diet Coke. Especially with ice. Hey...it's zero points on Weight Watchers...know what I mean? Creating! I love to write, draw, sew, craft, etc. etc. Blogging....of course we knew this one, didn't we? Holly at Holly's Haven. Yeah, I know, she's my little sister. But she is also one of the most talented people I know. 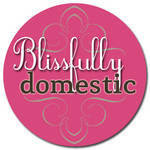 If you haven't visited her before, head on over to her blog, tell her I sent you! Kari & Kijsa. Such a wonderful blog. And they love diet coke! Reese & Marie. She's got such great taste - I just love her style. Ms. Tee at Delightful Home. Her blog always makes me happy. Stacy at 19 Butternut. She and I like so many of the same things. Love to read her blog! And one last thing...come join me over at Blissfully Domestic where I'm telling you all how to make my decoupaged barn star. Hope to see you there! Great Star Wars decor! My nephew is a big fan and would LOVE this! Thanks for sharing! We have several Star Wars fanatics at this house too! Who knew you could make Star Wars decor fashionable? My boys would LOVE this! Awww! You're so sweet, Wendy! Thank you for that! :) My son used to really be into Star Wars - what a great compromise. They look great framed in that black & with the letters. 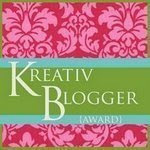 I am honored to receive this award from such a creative, inspirational blogger. Thank you so much, it really means a lot to me. I will post about it tomorrow! I am also married to a star wars enthusiast. I love the "in a galaxy far, far away" pillow. It is clever without being too tacky. Sniff. Dude, I am honored. LOL. I mean it. You rock. Thank you so much. 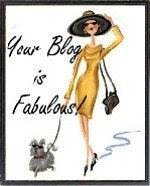 I'm so excited to check out the blogs you awarded! I'm sure they are wonderful!!! Congrats on your well deserved awards & the boys' bedroom looks great. I know that my sons will want Star Wars or Sponge Bob and I will want vintage sports. haha wendy, i finally had the courage to post on your blog. my brother who is 28 and married would love that bedroom. i will see you tommorrow hopefully, and i still want to get some pillows made. Great compromise with your son...the wall looks GREAT! Congratulations on your awards...you deserve them!!!! I think that Star Wars room was a great compromise! Looks cute! Kudo's on your awards. You deserve them! Big sis, you spoil me so. Thankyou super lots. It is so fun to reiceive an award. Congrats to you too!!! I LOVE the way that you took care of the 'Star Wars' motif issue. It really is darling. I think that the decorative lettering is was makes it a designer specific look. Well done young padawan. The star wars is great! Congrats on your awards..you deserve them and many more:)! Thank you so much for posting your ideas. I had a similiar problem with not wanting to spend the money on PB and wanting to appease the fans. I better not show this to my son...he is a Star WArs...fanatic! Great job Wendy..and wht a great MOM you are! Just found your blog. Great job on the compromise. I understand on the PBKids SW motif, but I did so love the throw pillow from that set! look at all the star wars fanatics around! my 6 year old could identify whose light sabers belongs to whom even before he knew the entire alphabet (and he hasn't even seen the full movies ... yet). good compromise and less $ than PBK. congrats on your awards. you deserve them all! The "force" was definatly with you when you came up with the idea for framing those posters and the vinyle lettering. Very creative! Hey Wendy! Congrats on all the awards! I'm trying to follow your blog, but the link is missing. Can't figure that one out...but I'll try again later. See ya! Congrats on your awards! The wall looks great. It' so hard when the kids get their own decorating ideas! hubby would have loved to have the starwars decor when he was a child! hmmm... what am i kidding he would probably like it in his office now! The PB Star Wars Duvet pattern is exactly the same as my husband's bedding from the 70's that his mom still has!!! How funny. I like what you did. Neat idea.